i know, because you can tell he’s been there. see the dirt on the light switch? whenever i’d leave a note & carrots out for the easter bunny on easter eve, the next morning the carrot would be gone and dirt would be smudged on the note. and see? here there is dirt and no carrot. 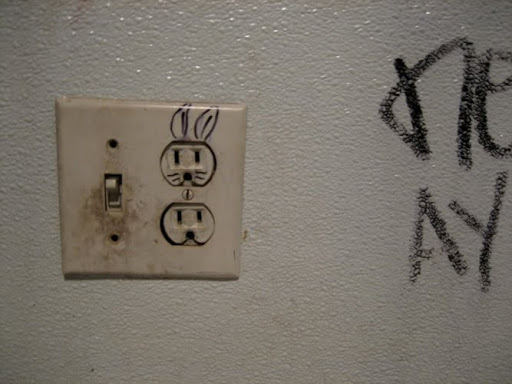 clear signs of a bunny, even without a bunny light socket–its presence just clinches the deal. This entry was posted in color, drawings by Alison Kranz. Bookmark the permalink. why thank you :)i wish i’d thought of it myself. i think i may carry it on to other places! Cool blog. I’ll keep an eye or two on it! As for the “bunny plug” situation, I’d get CSI out to the scene to investigate! I feel bad for the rabbit. I hope he/she/it didn’t end up in a stew somewhere or worse, part of some elderly woman’s wardrobe. Hey, that’s the real Energizer Bunny! That one on TV is just little sissy pink poser.